Ali Ijaz became popular as a comedy hero. He worked in 106 films, 84 Punjabi, 22 Urdu and one Pashtu film. 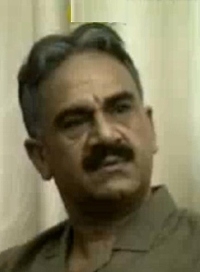 Ali Ijaz, a popular actor of film, radio, TV, and theater has died in Lahore at the age of 77. He was suffering from heart diseases and paralysis.He died due to a heart attack which proved to be fatal. He became popular as a comedy hero. He started his career with the film, “Insaaniat” in 1961,which was directed by Shabaab Kiranawi. He had paralysis attack a few years ago because of some family issues. He was given Presidential Award for his outclass performance on August 14, 1993. He worked in 106 films, 84 Punjabi, 22 Urdu and one Pashtu film. Some of the famous films are Insaaniat, Dubai Chalo, Dada Ustaad, Piyar Daa Pala, Bhaiyaan di jori, Yamli Jutt, Bad Naalon Badnaam Bura, Ishaq Maira Naa, Saadhu Aur Shaitan, Laila Majnoon, Zulam Kadi Nahee Phalda, Sadharsta, Baadal, Sohraatay Jawai, Mr Aflatun, Naukar Tay Malik, Wohti Da Sawaal Yai, Bawarchi, Dushman Piayara, Andhair Nagri, Dhee Raani, Chor Machai Shor, Ishq Maira Naa, Bharosa, Saala Sahab, Athra Puttar, Aap Say Kia Parda, Susraal Chalo, and Ishq Samandar. He also hosted many programmes on the Radio. He belonged to a Syed family and lived in Gojar Singh in Lahore. He was a close friend of Munawar Zarif and Rafi Khawar. In most of his films Rani, Naazli, and Ajuman worked with him. He also worked in a Hollywood film with Marlin Brando. Punjab Chief Minister Sardar Usman Buzdaar expressed deep grief and sorrow over the sad demise of the actor, Ali Ijaz.